Tour the Smith-Appleby House — festively decorated from floorboards to rafters to celebrate Christmas — on Saturday, December 19, from 1 p.m. to 4 p.m. 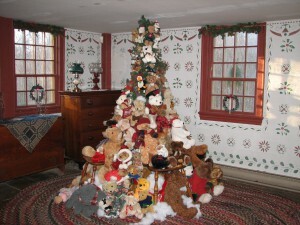 Visitors will delight in the beautiful Holiday trimmings as volunteers from the Historical Society of Smithfield in Colonial-era dress host tours of the historic 319-year-old house. The Smith-Appleby House dates to 1696 and was built by Elisha Smith, the grandson of John Smith “The Miller,” a member of Roger Williams’ original party of six men who left the Massachusetts Bay Colony to start the colony of Providence, Rhode Island, in 1636. Expanded from its original construction as a one-room stone-ender cottage, the delicately restored 12-room historic farmhouse features beautiful cabinet work, varied architectural designs, original stencils, and furnished rooms showcasing an intriguing collection of antiques. Visit the Smith-Appleby House at 220 Stillwater Road in Smithfield, RI, just off I-295. In case of inclement weather, check our website at http://www.smithapplebyhouse.org/calendar or call 401-231-7363 for cancellation information.